I’ll start by saying that at this point in my children’s lives, I really don’t need a cart… but gee whiz I’m searching very hard for a reason to own one of these beauties by Kaiku Design. Kaiku means ‘to grow’ in Japanese; and the simple, clean design of the Kaiku pieces screams Scandinavia. However Kaiku is the work of Californian couple Scot and Amy Herbst. With the birth of their children, the Herbst team focused their design skills on creating meaningful and high quality children’s playthings built to last a lifetime. All natural products – predominantly Baltic birch wood, natural rubber, cotton and woven rattan – plus safe, non-toxic finishes are just part of the appeal of Kaiku. The simple, sleek shapes give these classic toys a thoroughly modern designer edge. The centrepiece of the collection is the Zen Superwagon. Built to hold two passengers over eighteen months old, the Hebsts created the Zen to encourage parents to get out and about with their children. And who wouldn’t, with this fabulous wagon?! 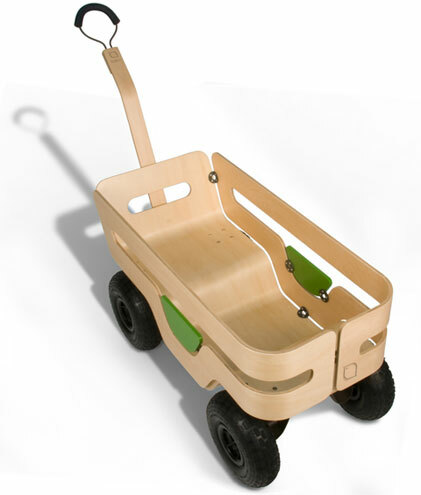 Also in the collection is the Pushpull wagon, sized for toddlers who need to move stuff around (which as we know, is all toddlers) and the absolutely divine Strollkart, also built for moving stuff but in more of a shopping trolley style. Thankfully my daughter loves nothing more than being in charge of a trolley, so perhaps we can have some Kaiku in our lives after all. The Zen is US$319, the Pushpull is US$165 and the Strollkart is $149. Add a rattan carry basket to your Zen for US$40. Kaiku ships to Australia.